The Round of 8 in the Monster Energy NASCAR Cup Series playoffs resumes this Sunday (Nov. 4) with the AAA Texas 500 at Texas Motor Speedway. The green flag flies Sunday at 3 p.m. ET on NBCSN. 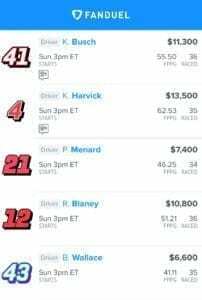 Just three total races remain for daily fantasy and the 2018 MENCS season. Also, with only 0.1 points awarded for each lap led by a driver, the need for a dominator is less important when building a winning lineup. The 334-lap race will only have a total of 33.4 points up for grabs in this category. Take note when building your roster and focus on midpack drivers who can climb up toward the front on race day. Harvick sealed his trip to Homestead-Miami Speedway with a win in this race a season ago. That was his first victory at Texas and it looked like he may make it two in a row in the spring race earlier this season. Harvick led the first 43 laps and was in the fight up front for much of the first half of the race. He ultimately finished second. Part of a strong qualifying effort for Fords across the board, Harvick starts third for Sunday’s race. Despite a 25-point gap over the cutline, he’ll be motivated to secure his Homestead spot with a victory for a second straight year. Busch has been one of the best at Texas over the past five years. He has three wins at the track since 2013 and has led in all but two races during that span. He led 116 laps en route to the win here back in April. The younger Busch is the series points leader and also in a comfortable position to make Homestead on points. Another win in the Lone Star State would only improve his odds on winning another championship. Truex is winless at Texas, which is surprising when looking at his history of overall success on 1.5-mile tracks. Before being involved in an early race wreck back in April, the reigning series champion had six straight top-10 finishes at TMS. He was the runner-up in this race last season and has led over 100 laps in two of the last five Texas races. Motivated after the last-lap Martinsville mishap with Joey Logano, Truex knows he needs a solid run Sunday to quiet the critics and secure a spot at Homestead. Don’t underestimate the reigning MENCS champion’s ability to get the job done. Elliott has the best average finish among all active drivers at Texas. Even though he has only made five career starts at the track, from day one the young driver has become a threat for the win. He finished fifth in his debut back in 2016 and followed that up with runs of 11th or better in every race since. The past few weeks have been tremendous for the young NASCAR superstar. He has multiple wins and is also becoming a serious underdog contender for the championship. An upset at TMS is a strong possibility for the only Chevrolet driver left in the playoff field. Kurt Busch has started on the pole for the last two Texas races prior to this weekend. He led 40 laps and finished seventh in the spring and has brought similar speed back for the fall. Busch was one of four Stewart-Haas Racing drivers to qualify inside the top seven for Sunday’s race; overall, Fords took seven of the top-10 spots. The elder Busch is also a consistent top-10 driver. He may not compete for the win, but expect him to run up front while trying to eke out a championship spot on points. Blaney picked up his first Texas top-five finish back in April, besting a career-high sixth that he set last fall. Those two races weren’t even his best at the track. In the spring of 2017, Blaney started on the front row and led 148 laps, dominating the first half before fading to 12th. This Sunday’s pole sitter has nothing to lose after being eliminated from the championship chase a few weeks ago. With three straight solid showings, he could be a sneaky pick to win on Sunday. Wallace has only made one career Texas start at the Cup level, but it was a good one. Wallace started 15th and finished eighth, also one of his best runs of the year for Richard Petty Motorsports. While this season as a whole has been up and down for the rookie, that race remains a reminder he has the talent to run up front. At the low price of $6,600, anything close to a top-10 finish would be as good as a win for your team. Previous 2-Headed Monster: How Does Chase Elliott v. Denny Hamlin & Martin Truex Jr v. Joey Logano Compare? Bubba !!! Your joking right !